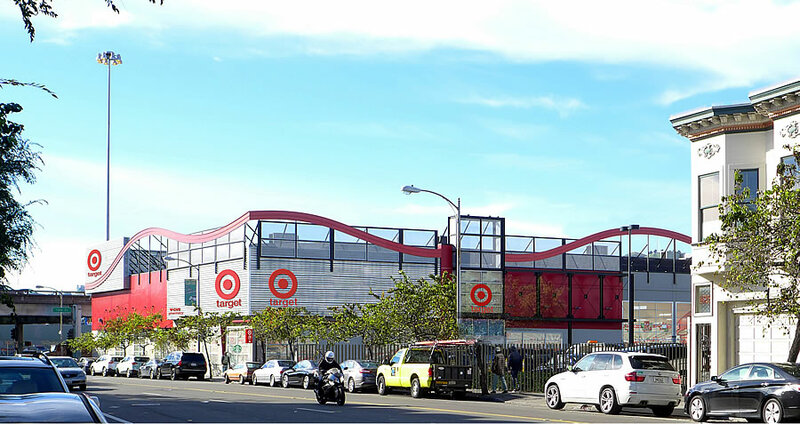 The formal application to convert the former Sports Authority building at 1690 Folsom Street into a full-service Target has been filed with Planning. The conversion wouldn’t require an expansion of the 40,000-square-foot building nor a major change to the building’s façade, save new signage. And as proposed, a full-service CVS Pharmacy and Starbucks would be located within the new Target as well. Wow. That parking lot has ~50 stalls. Talk about a nightmare waiting to happen. Hopefully, it won’t turn into a Trader’s on Masonic. The current parking lot has 54 spaces to be exact, two (2) of which will be removed to accommodate new landscaping, screening and flow of the lot. 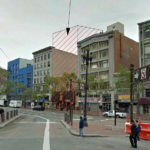 And as such, the project is “not anticipated to have a significant impact on local traffic, off-street parking, or other transportation concerns,” at least according to Target’s land use attorneys. walk to target. hahahahhah. who goes there to buy stuff you can carry in one bag? I do it every time I shop there. Welcome to San Francisco. I’ll sometimes go to the Target at the Metreon…but often you just need more supplies. Hence the drive to Serramonte with a good excuse to stop at In-N-Out. Guess I’m not in the demographic that has 5 boxes from Amazon delivered daily. I walk to Target once or twice a month, walk to TJ’s a few times a week. Would drive if they weren’t within walking distance. This will actually work fine, and Bravo to Target for realizing it. While 50 parking stalls wouldn’t work for a suburban Target, it will work for this one. Between the fact that many patrons will actually bike/walk/take transit or TNC vehicles to get there, there is also actually plenty of parking in the hood, both on the street and in other parking lots (Best Buy is a hike, but Office Max is really only a block away and never full). Yes, maybe technically not allowed, but nobody is policing it for short periods. +1 … frequently walk to/from the Target at Masonic & Geary. People who live within a reasonable distance, which is only increasing in that neighborhood. I thought the same thing when they put in the Target at Masonic & Geary, but it has turned out not to be a problem. I usually find parking there when I do drive, but I usually walk/transit. If the SBUX is run as poorly as the one at 789 Mission we are in for a real treat. Do not understand why someone wouldn’t build 7-10 floors of housing here. And on top of the TJ’s / BB&B nightmare while we’re at it. Because the zoning for the site is only like 55 feet, courtesy of the Western SoMa Plan, run by residents of the neighborhood. That’s why. In that light, it’s better to land bank the site for a decade by reusing the existing building with a disposable use like some formula retail rather than redevelop it at only 55 feet with too little housing and have it underbuilt for the next 100 years. Good analysis. This is next to the Central Freeway as well, so it’s not a great location for housing. When we take the Central Freeway down and give it the boulevard treatment, that’s when it’ll make sense to build these adjacent parcels up. So upzone now and build up. 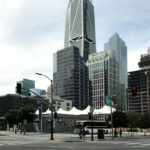 Plenty of mid- and high-rises in SoMa are already next to freeways, though I agree 55 feet is embarrassingly low. All the freeway-adjacent parcels could be upzoned for mixed use and residences above in midrises make sense. (Best Buy next). Bicycle parking garages could exit right on the raised bicycle lanes on the capped Feeeway. The low heights near the freeway date back to Susan Montana (sp?) the planner who i quote noted, “views of the city from those driving north on the freeway” was the reason! @oh my: Views from the freeway, ugh! I didn’t realize it was possible for me to be angrier about Western SoMa’s height limits than I already was. What a backwards reason. Taller buildings would block the freeway’s noise and pollution to improve the experience for *people* on the streets. Freeway-adjacent parcels could be okay as efficient stacked PDR or as offices (see The Exchange) with higher height limits and without waiting for the freeway to be removed. I still don’t think housing next to freeways is a good idea. You don’t want children and babies, who are extra vulnerable to air pollution, to be spending 2/3 of their lives next to a freeway, which is something that isn’t going to happen if adults merely work there. The remaining stub of the Central Freeway will come down. It’s a useless vestige of 1950s transportation philosophy. The City should have bought the lot, ala the Haight/Stanyan McDonald’s. A few hundred units of BMR housing could have been built. There’s already another great affordable project on McCoppin/Valencia. More please! Take the central freeway down? That thing is already a mess. You’ll back traffic up into the city for miles by cutting it back further. What are you thinking? Scott is counting on a victory in the city’s war on cars. Be careful what you wish for. Who said anything about taking the freeway down? The rendering shows it next to the freeway which is how I assume many of its patrons will arrive. People are more important than cars. What are YOU thinking? Yes, but cars are driven by people, and those people — and there are lots and lots of them — rely on the Central Freeway. Taking down the freeway would disrupt more lives than it would benefit, IMO. We survived the removal of the north-of-Market segment of the Central Freeway (and the Embarcadero Freeway). Both Hayes Valley and the Embarcadero sprung to life immediately after the freeways were demolished. The “gridlock” never occurred, or at least it’s not any worse than when the freeways were standing. Both are great additions to SF’s neighborhoods, and economy. There’s no reason to think that the same wouldn’t happen in the SOMA/Mission when this freeway is removed. Thank you. Sometimes I forget it’s not as obvious to everyone that urban freeways are both unnecessary and a disaster for neighborhoods as it is to me. You eloquently explained why. “We” survived? The traffic in that area is horrific. Admittedly it was an obnoxious eyesore, but it did serve a purpose. The supposed Octavia Street solution is one of the worst designed pieces of newer public roadway in the City and is another colossal choke-point which only serves to frustrate motorists and unnecessarily increases emissions due to idling vehicles stuck in traffic. I am all for beautification and housing, but not at the expense of efficiently moving vehicle through the City. There needs to be more thorough planning put into these projects so that everyone benefits. For whatever it’s worth, I live and work in this city, I shop in this city, I bike in this city, I drive in his city and I am a pedestrian in this city. I am trying to look at the big picture from all sides. Yay! for the Target. Ix-nay the Starbucks. CVS is a’ight. Yes yes yes yes yes and YES. I was just discussing this project with my partner last night. GIT ER DON! All within a couple blocks: Target, Best Buy, OfficeMax, Foodco, Cash-n-Carry, Rainbow and Costco.. (plus Safeway on 16th) All big box, car-centric operations. Who would’ve thought. Looks like we are finally seeing some relief from the cost of living in SF. Yaaay! I live close to, and visit often, the Target at Geary/Masonic. Although in total that complex has a lot of parking, I don’t think anyone going to that Target ever uses anything except the tiny lots on the 2 lowest levels (where Target actually is). Based on the number of people who are in there, they are getting foot and Muni traffic as well. This location would probably be OK with the spaces in the existing lot (plus whatever you can find on the street–I can’t keep up with what the city has done right along there with the bike lanes and yes/no to parking along Division). Wait so a national retailer who locates in every major city in the US… wants to backfill a former formula retailer…who has been closed for a year… wants to open and re establishing tax revenue and creating new jobs? Interesting, it looks like this has become a Goodwill store. Maybe that’s a temporary measure while the application to build the Target works its way through planning.